Indium is a poor metal with uses in the semiconductor industry and LCD industry. Indium is also used in thin-film solar cells in combination with copper, gallium, and selenium. Indium-111 is used in nuclear medicine for imaging leukocytes. There are very few indium minerals, two of which are indite and dzhalindite. It is produced mainly as a byproduct of zinc production. Domestic Production and Use: Indium was not recovered from ores in the United States in 2010. Two companies, one in New York and the other in Rhode Island, produced indium metal and indium products by upgrading lower grade imported indium metal. High-purity indium shapes, alloys, and compounds were also produced from imported indium by several additional firms. Production of indium tin oxide (ITO) continued to be the leading end use of indium and accounted for most global indium consumption. ITO thin-film coatings were primarily used for electrically conductive purposes in a variety of flat-panel devices—most commonly liquid crystal displays (LCDs). Other end uses included solders and alloys, compounds, electrical components and semiconductors, and research. The estimated value of primary indium metal consumed in 2010, based upon the annual average New York dealer price, was about $66 million. Recycling: Data on the quantity of secondary indium recovered from scrap were not available. 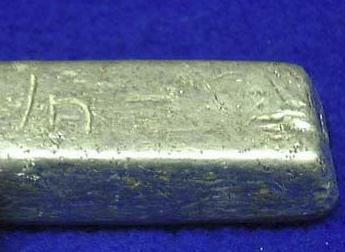 Indium is most commonly recovered from ITO. Sputtering, the process in which ITO is deposited as a thin-film coating onto a substrate, is highly inefficient; approximately 30% of an ITO target material is deposited onto the substrate. The remaining 70% consists of the spent ITO target material, the grinding sludge, and the after-processing residue left on the walls of the sputtering chamber. ITO recycling is concentrated in China, Japan, and the Republic of Korea—the countries where ITO production and sputtering take place. An LCD manufacturer has developed a process to reclaim indium directly from scrap LCD panels. Indium recovery from tailings was thought to have been insignificant, as these wastes contain low amounts of the metal and can be difficult to process. However, recent improvements to the process technology have made indium recovery from tailings viable when the price of indium is high. Import Sources (2006–09): China, 35%; Canada, 26%; Japan, 16%; Belgium, 8%; and other, 15%. Events, Trends, and Issues: The price of indium recovered in 2010 after declining sharply during 2009. The U.S. producer price for indium began the year at $500 per kilogram and increased to $570 per kilogram in late January; the price remained at that level until mid-September. The New York dealer price range for indium began the year at $460 to $500 per kilogram, and increased through the end of May, reaching a high of $580 to $640 per kilogram. The price range then decreased and leveled off at $525 to $565 during June and most of July, after which it modestly increased to $550 to $575 per kilogram by mid-September. Indium consumption in Japan (the leading global consumer of indium) was expected to increase by 20% in 2010 from that of 2009. Additionally, Chinese indium consumption was expected to continue to increase significantly, rising by 56% from that of 2009 to 75 tons owing to increased domestic demand for LCD-containing electronics. China planned to increase its domestic manufacturing of high-end LCD electronics rather than sell the raw materials to Japan and buy back the electronic products at high prices. As a result, the Chinese Government cut its second half 2010 indium export quotas by 30%. China’s 21 indium producers were allowed to export a combined total of 93 tons of indium in the latter half of 2010, compared with 140 tons during the first half of the year. Most of this material was exported to Japan for consumption. In the downstream market, demand for ITO targets increased during the first half of 2010 from that of the second half of 2009 owing to a rise in LCD panel production. However, LCD panel inventories began to increase during the second half of 2010 owing to lower-than-expected LCD sales in the United States and global economic uncertainty. One LCD panel producer initiated a 30% production cut at one of its Japanese plants to control inventory. As a result of weakening LCD demand that occurred in the latter half of 2010, LCD panel producers lowered prices, resulting in an aggressive price competition among flat-screen LCD TV producers. However, ITO producers were not able to significantly lower their prices as higher indium prices in 2010 cut into profits. World Resources: Indium’s abundance in the continental crust is estimated to be approximately 0.05 part per million. Trace amounts of indium occur in base metal sulfides—particularly chalcopyrite, sphalerite, and stannite—by ionic substitution. Indium is most commonly recovered from the zinc-sulfide ore mineral sphalerite. The average indium content of zinc deposits from which it is recovered ranges from less than 1 part per million to 100 parts per million. Although the geochemical properties of indium are such that it occurs with other base metals—copper, lead, and tin—and to a lesser extent with bismuth, cadmium, and silver, most deposits of these metals are subeconomic for indium. Vein stockwork deposits of tin and tungsten host the highest known concentrations of indium. However, the indium from this type of deposit is usually difficult to process economically. Other major geologic hosts for indium mineralization include volcanic-hosted massive sulfide deposits, sediment-hosted exhalative massive sulfide deposits, polymetallic vein-type deposits, epithermal deposits, active magmatic systems, porphyry copper deposits, and skarn deposits. Substitutes: Indium’s recent price volatility and various supply concerns associated with the metal have accelerated the development of ITO substitutes. Antimony tin oxide coatings, which are deposited by an ink-jetting process, have been developed as an alternative to ITO coatings in LCDs and have been successfully annealed to LCD glass. Carbon nanotube coatings, applied by wet-processing techniques, have been developed as an alternative to ITO coatings in flexible displays, solar cells, and touch screens. Poly(3,4-ethylene dioxythiophene) (PEDOT) has also been developed as a substitute for ITO in flexible displays and organic light-emitting diodes. PEDOT can be applied in a variety of ways, including spin coating, dip coating, and printing techniques. Graphene quantum dots have been developed to replace ITO electrodes in solar cells and also have been explored as a replacement for ITO in LCDs. Researchers have recently developed a more adhesive zinc oxide nanopowder to replace ITO in LCDs. The technology was estimated to be commercially available within the next 3 years. Gallium arsenide can substitute for indium phosphide in solar cells and in many semiconductor applications. Hafnium can replace indium in nuclear reactor control rod alloys. Teck Cominco (NYSE: TCK) - http://products.teckcominco.com/Products/Indium.html - The world's largest producer of indium. Their specialty metals division also produces bismuth, germanium, and cadmium. SMG Indium Resources - http://www.smg-indium.com/ - Private company stockpiling indium. 2010-10-27 - (tr) - Are we running out of touchscreens?